I’ll start by being brutally honest. I did not want to write this post. In some way, I thought sharing what I have been going through would glamorize it in a way that would deceive me into thinking I was better when I am not. I decided against thinking that way and decided to share instead. Change has always been second nature to me. I learned to embrace change as a child after changing schools three times while growing up. From going to boarding school, moving to new cities and even finally going to a different continent… to me, change was necessary and I embraced all that came with it. I understood change and I thought I understood what it felt like to be alone. Boy, was I totally wrong. They say solitude is the greatest teacher but I bet they never tell you how truly trying solitude can be. I never thought that I’d be writing this post when I first moved out here but well, here I am. Moving to D.C has had its ups and downs but with too many downs, it’s not been the best. I realized that with all the change I have gone through one constant was that my friends and family were always with me. When I moved schools, I had my brother and my mum. When I moved continents, I had my uncle and when I moved cities, I found friends pretty quickly (college had a lot to do with this). It’s been 100+ days since I have moved to D.C alone, no friends, no family and for the first time, I felt the dynamics of change and the impact of a true move. To tell you the truth, I did not know how to handle it. This sudden bout of loneliness. This solitude. I had no friends to visit that lived right beside me and felt exhausted thinking of constantly trying to make new friends. I had no family to cook for me when I was hungry and when I went to work and came home… no-one was waiting for me. It took awhile for me to adjust to this new found space. I cried myself to sleep for nights and I found myself trying to forge friendships without thinking about who I was and what I wanted. I simply wanted to find my groove and quickly too slowly forgetting the “me” in the process. That didn’t work out too well as you would imagine and then I was back to square one. Time alone, means time for you to think, to revive yourself, and to understand that there is a strange solace in the quiet. Time alone means time for YOU. I began to learn how to live and it was incredible. I learned that we all need to be alone sometimes, so we can learn the importance of being alone and how that builds you into a woman/man that you never saw coming. Until you are truly happy with yourself, be alone. Until you learn to stop hating yourself and the person in the mirror, be alone. Until you go out to have fun not just hoping you’ll meet someone, be alone. Until you become selfish with your time, be alone. Yes, you read that right. be alone. Grow from the solitude. 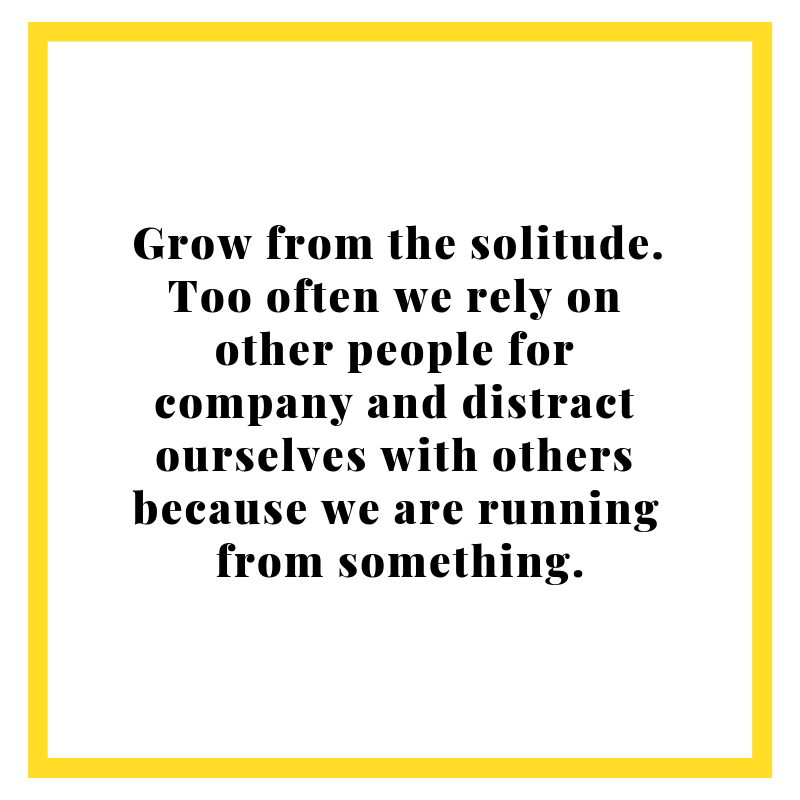 Too often we rely on other people for company and distract ourselves with others because we are running from something. Too often we choose not to go to the movies alone, not to take that trip alone, not to take that leap of faith… alone. I learned that it is okay to be alone, I learned that reading a book, and getting lost in it was equivalent to having a great time. It has been a necessary and completely unwarranted evil being alone, but although we all hear that there is strength in numbers but what they fail to often say is that there is quiet power in solitude.